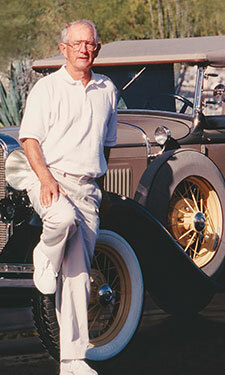 In 1964, after 11 years with Ford Motor Company in Los Angeles, Jack Gosch wanted to become a car dealer. The dealership in Hemet was for sale, and in 1964 he founded Jack Gosch Ford – just three months after the Ford Mustang was introduced. With just 12 employees, the dealership was in the smaller section of the larger Loomis Turkey hatchery building in downtown Hemet. Successful from the start, Jack Gosch Ford grew with the valley. Jack enjoyed the small-town atmosphere and personally knew many of the customers who came into the store. With a growing business, Jack built a new Ford dealership in 1970 at the corner of Florida and Dartmouth. He opened Gosch Toyota next door in 1972. His son’s Eric and Marc joined the business in the early 80’s. Jack was very involved in local community groups and clubs. He opened the first fast food franchise in Hemet, a Taco Bell, in 1969. And he was a founder of The Bank of Hemet in 1974, which still is a very successful local bank. In the mid-80s it became apparent that the future growth of the area would be on west side of the valley. Jack convinced the other six car dealers in town to join together without an outside developer. With the participation of the City of Hemet, Jack spent five years planning the Hemet Auto Mall. The result was that the City doubled its auto sales tax revenue by bringing in the dealerships from outside the city limits. Gosch Auto Group today has four dealerships in the Mall. On a personal note, Jack was a lifetime tennis player until he had to have both hips replaced. He took up golf and enjoyed regular 90-score rounds. But in 2003 at 73 years old, Jack made worldwide news by hitting back-to-back holes-in-one at Sunrise Country Club in Rancho Mirage, on holes #10 and #11. His achievement was picked up by the AP news organization and made news around the world. The Guinness Book of World Records said this feat has been performed several times before. Jack passed away in 2013. The Gosch family currently owns auto dealerships in Hemet, Temecula and Escondido. During our 54 years we and our 620 team members are proud to have sold over 400,000 vehicles to local customers, and serviced millions of cars. Our success is because our staff knows our customers are really the ones who pay our paychecks. Marc and Eric continue to lead the company, and are excited that their sons Patrick and Matthew, who both work in the company, are continuing with the family business.